« Does Sugar Affect Cholesterol Levels? Seattle Nutritionist, Angela Pifer writes: How do you turn high fructose corn syrup into a healthy and fresh new harmless corn sugar? You rename it. The corn refiners recently launched a new campaign to rename the one single ‘food’ that Americans consume more than any other food calorie, high fructose corn syrup. With consumption of high fructose corn syrup at a twenty year low, the corn industry is looking for a hail Mary in an attempt to save its highly profitable ingredient (Archer Daniels Midland, one of the world’s top producers had 2009 revenues topping $69 billion). Corn Sugar – doesn’t this sound harmless, unprocessed and natural? In fact the corn industry has already started marketing with this term by creating a new website and has commercials saying, “High fructose corn syrup HFCS — corn sugar — has been used in the food supply for more than forty years to make high fiber foods palatable, maintain freshness and enhance flavors in foods and beverages. Additionally, high fructose corn syrup keeps our foods affordable.” Audrae Erickson, president of the Washington-based group, says that the new name would help people understand the sweetener. Really? I am not sure how renaming this product will help people better understand it. Instead the industry should take the time to educate people on the difference between HFCS and sugar. Both compounds contain two simple sugars, fructose and glucose. The difference between these two compounds is that sucrose is 50% fructose and 50% glucose. HFCS is made up of 55% fructose, 42% glucose and the remaining 3% are higher saccharides, larger sugar molecules. The fructose in HFCS is more easily absorbed and utilized because it is free and unbound (in sucrose, every fructose is bound to a glucose molecule and must go through an extra metabolic step before it can be utilized in the body). When fructose is quickly absorbed and metabolized, it is done independent of insulin. Though this may sound like a good thing, it is not. If insulin is not signaled and released then leptin is not signaled and released (a key signaling hormone that regulates food intake and body weight). When this signaling system is bypassed, the body will continue to crave food. Studies have shown that beverages with added sweeteners may enhance caloric overconsumption. On average, Americans consume 60 pounds of HFCS per person per year. HFCS accounts for 40% of caloric sweeteners in the United States. The consumption of HFCS increased more than 1000% between 1970 and 1990, far exceeding the changes in intake of any other food or food group. The increased use of HFCS in the United States mirrors the rapid increase in obesity. Instead of starting a new site and using the name corn sugar (prior to approval by the FDA) they should start a site that talks about recent studies published on HFCS. Until now, the majority of studies have been short term studies and the results have been mixed. A new study from Princeton researchers published in February 2010 looked at both short term and long term affects of HFCS on body weight, body fat and triglycerides. The study showed that over the course of 6-7 months mice that had 24 access to an 8% HFCS “drink” and mice chow gained significantly more body weight (specifically adipose fat in the abdominal region) and had elevated triglyceride levels. Previous studies from Princeton has firmly established that if you give rats access to a 10% table sugar “drink” in addition to their normal feed (mice chow), they do not gain additional fat. In other words, their bodies are able to metabolize the extra calories without creating more weight. The take home message? Sucrose is not ‘better’ than HFCS, other than it is natural and we can metabolize it. If weight loss is your goal, keep all natural sugar intake to a minimum and remove every bit of HFCS from their diet. Limit the intake of natural sweeteners like honey, agave nectar and real maple syrup. Seattle Weight Loss Programs – Get Results! 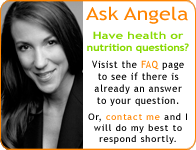 Hi Angela: My questions are: Is corn healthy? Is gluten dangerous? How can I maintain a healthy glucose reading? What are the foods that I have to avoid for a better nutrition? Great questions! If you are not sensitive to corn and gluten, they you can consider whole food sources of corn and gluten to be healthy. The best way to manage blood sugars is with the pattern: breakfast, snack, lunch, snack, dinner. Always pair a carbohydrate with a protein and eat whole foods and not processed foods. I don’t like to focus so much on foods you should stay away from as much as to offer the guidance that you want to eat whole foods: foods you can picture growing and that your grandmother would recognize as food.